Beautiful designs from the imagination of appliqué artist Denise Sheehan await as you step into the harmonious world of Graceful Rhapsody. Come join Denise as she shows you how to compose your own quilt, striking the right blend of melody and harmony. The appliqué featured in Rhapsody is a tribute to the timeless beauty of paisleys. Embroidered accents and a soft arrangement of pieced and alternate blocks enhance the applique. The balance of paisleys and flowers in blue, grey and taupe will make your heart sing. 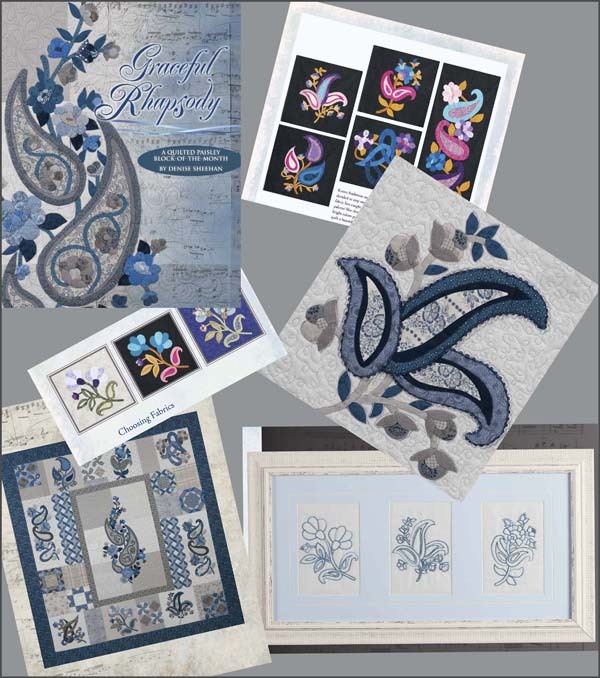 Additional projects found inside – including an embroidered wall hanging – are based on these beautiful paisley delights!